Bang Pa-In Palace in Ayutthaya Province. Aisawan-Dhipaya-Asana Royal Residence. Video of Bang Pa-In Palace at bottom of this page. 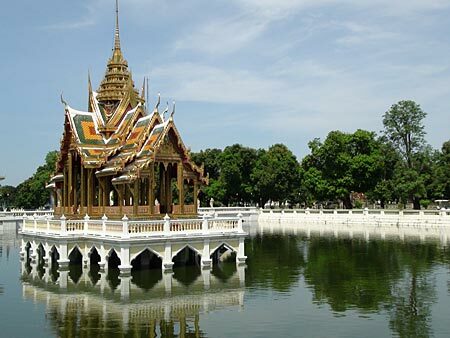 King Prasart Thong (1629-1656), had a palace constructed on Bang Pa-In island in the Chao Phraya river. Ponds were dug and also a monastery was established. One of the residences was named Aisawan-Dhipaya-Asana Royal Residence, constructed in 1632. It is not known whether the palace was still in use by the time of the demise of Ayutthaya in 1767. Chronicles from the early 19th century indicate that the place was abandoned and overgrown at that time. King Rama IV had a temporary residence constructed at the site, and the present-day royal palaces and residences date back to the reign of King Chulalongkorn (1868-1910). The famed small pavillion in the middle of the pond, the Aisawan-Dhipaya-Asana Royal Residence was (re)constructed between 1872 and 1876. At present, many beautifully restored residential halls and palaces are on the ground of Bang Pa-In. Without doubt, Bang Pa-In is one of the best kept old palace ground in Thailand and it is a pleasant experience to walk around the place. Most of the buildings are in 19th century European style. A striking construction, both outside and inside is the Phra Thinang Wehart Chamrun Residential Hall, built in Chinese architecture. 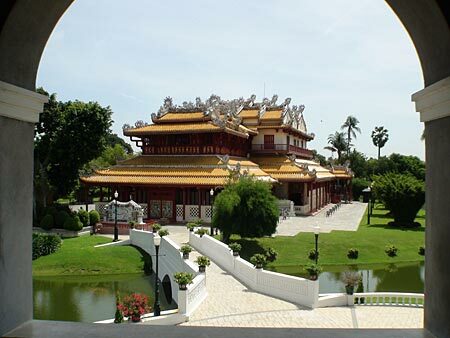 The residence is likely the finest Chinese architectural building in Thailand. In the middle of the pond stands Withum Thasana Tower, built in 1881. 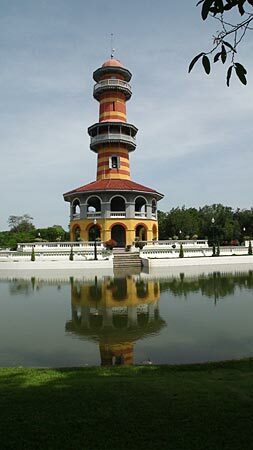 It stands 30 meters high and it takes 112 steps to reach the top platform, from which there is an excellent view over the grounds of Bang Pa-In. Bang Pa-In has a railway station on the Northern Line. Reportedly three trains stop at Bang Pa-In daily. So you can go either from Bangkok or Ayutthaya (30 kilometers north of Bang Pa-In. Both the train station and the bus station are a few kilometers away from the palace, so you need to find some local transport to get there. From Ayutthaya, songthaews go to Bang Pa-In from the bus station off Naresuan road. We did it, it was a very disappointing and slow experience, so much so, that we jump off the songthaew on the way back, and found a taxi to take us back to Ayutthaya (at a price). Larger images of Bangpa-In Palace, Ayutthaya.